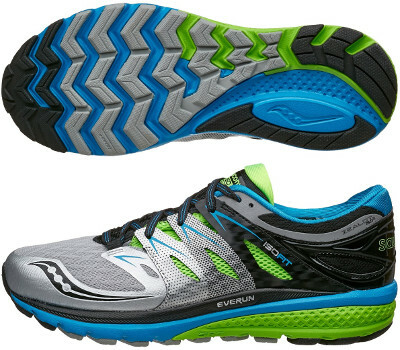 Saucony Zealot ISO 2 are neutral cushioned running shoes. The disruptive Saucony Zealot ISO 2 updates the idea of premium running shoe plenty of cushioning, sockless fit, incredible lightness and just 4 mm drop with latest technologies like EVERUN midsole and TRI-FLEX outsole following other top models from the american brand like Triumph ISO 2 and Hurricane ISO 2. Upper gets an upgrade from its predecessor Zealot ISO keeping a plush inner fit sleeve and a flexible external cage (ISOFIT™) which is now shorter allowing more flexibility in the forefoot with FlexFilm overlays. A more elaborated heel counter features improved support and stiffness. Major change in Zealot ISO 2 takes place in midsole where new full-length EVERUN layer has been added on top (just below sockliner) for improved responsiveness and increased cushioning. PWRGrid+™ is still the main foam in the midsole combined with SRC Impact Zone for great shock absorption and fluid heel-to-toe transition. Outsole has been completely redesigned with new TRI-FLEX configuration for improved flexibility and smoother ride. It is made of softer rubber (IBR+) in the forefoot to enhance cushioning and responsive ride and more durable carbon one (XT-900) in more exposed areas.